Boron nitride nanotubes, like their carbon cousins, are rolled sheets of hexagonal arrays. Unlike carbon nanotubes, they're electrically insulating hybrids made of alternating boron and nitrogen atoms. Insulating nanotubes that can be functionalized will be a valuable building block for nanoengineering projects, Martí said. "Carbon nanotubes have outstanding properties, but you can only get them in semiconducting or metallic conducting types," he said. 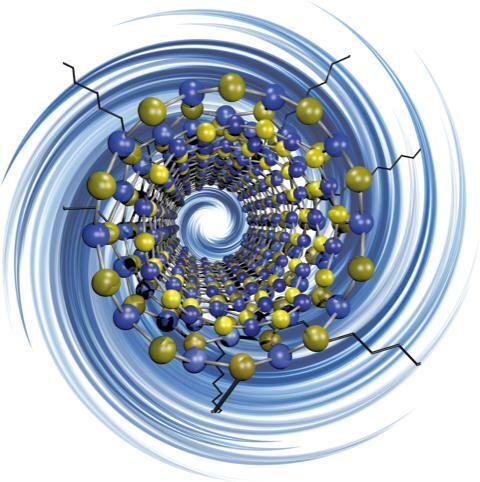 "Boron nitride nanotubes are complementary materials that can fill that gap." Until now, these nanotubes have steadfastly resisted functionalization, the "decorating" of structures with chemical additives that allows them to be customized for applications. The very properties that give boron nitride nanotubes strength and stability, especially at high temperatures, also make them hard to modify for their use in the production of advanced materials. "Functionalizing the nanotubes modifies or tunes their properties," Martí said. "When they're pristine they are dispersible in water, but once we attach these alkyl chains, they are extremely hydrophobic (water-avoiding). Then, if you put them in very hydrophobic solvents like those with long-chain hydrocarbons, they are more dispersible than their pristine form. "This allows us to tune the properties of the nanotubes and will make it easier to take the next step toward composites," he said. "For that, the materials need to be compatible." After he discovered the phenomenon, de los Reyes spent months trying to reproduce it reliably. "There was a period where I had to do a reaction every day to achieve reproducibility," he said. But that turned out to be an advantage, as the process only required about a day from start to finish. "That's the advantage over other processes to functionalize carbon nanotubes. There are some that are very effective, but they may take a few days." The process begins with adding pure ammonia gas to the nanotubes and cooling it to -70 degrees Celsius (-94 degrees Fahrenheit). "When it combines with sodium, lithium or potassium — we use lithium — it creates a sea of electrons," Martí said. "When the lithium dissolves in the ammonia, it expels the electrons." "We call it defunctionalization," Martí said. "You can functionalize them for an application and then remove the chemical groups to regain the pristine material. That's something else the material brings that is a little different." Read the abstract at https://pubs.acs.org/doi/10.1021/acsanm.8b00633.